Following on from the success of “Francesca” by Donald Finnaeus Mayo, we are delighted to announce the new release of the Ebook edition of Kevin Stevens’ novel “Reach the Shining River” by the UK’s leading independent digital publisher, Endeavour Press. It is now available for order on Amazon here. The effects of the Depression are still being felt, gangsters are running the show, and the police are corrupt. Emmett Whelan, an idealistic county prosecutor who has left behind his Irish roots and married into the country club set, takes on the city’s corrupt political machine when he investigates the brutal murder of a black musician. Emmett starts poking around and soon finds that there has been no investigation into the man’s death. He starts to wonder why a gentle man like Eddie was murdered? As Emmett probes the case and meets another outsider, black jazz singer Arlene Gray, he discovers the city’s underbelly of racism and criminality. Emmett hires a PI to help him, Mickey McDermott lost his job as a cop when he wouldn’t play by the rules. Soon they see that Eddie’s death is connected to some pretty powerful men in town. But as Emmett works harder and harder for justice, his marriage starts to disintegrate. And the more he digs, the more he sees he’s being played. Reach the Shining River is an urban crime drama about money, race, and class. Tense and full of memorable characters, it has the smell of a big river, the atmosphere of 1930s America, and a soundtrack that is pure jazz and blues. Without answering him or even excusing herself, Arlene rose and went to the bathroom. She locked the door, splashed water on her face, and sat on the toilet. On the back of the door was a framed photograph of Paul Robeson. Leonora had placed little baskets along the rim of the wash basin, each filled with a different colored soap. She covered her face with her hands and cried noiselessly. There was Eddie in her mind’s eye, standing tall in her front doorway on that last evening, molding the crown of his hat with forefinger and thumb, wearing the dark suit with pencil stripes that he favored when the sun went down. “I’m not inclined,” he had said. This last phrase Eddie spoke with a sly tone, his way of offering to end the spat on friendly terms. He frowned, put his hat on his greased head, and wandered into the night. See if I care. Her last words to him. Words he carried into the next world. Words she would carry through the rest of her earthly life. And Virgil gone missing. Maybe murdered as well. What had they done? Who had they crossed? She and Eddie had rarely argued. He was a peacemaker, even when he was unhappy with something (her wedding ring, not being able to come by the house when Wardell was home). The secrecy of their affair suited them both, and was easy to disguise because of their musical partnership. He liked to slide along the easy way, Eddie did, and keep his head low. But lately he’d been prickly. He had to borrow a few bucks from her once or twice, which hurt his pride, and couldn’t find work outside the weekend gig at the Sunset (Emmanuel Baptist didn’t pay). His needs were modest, but he liked his reefer and new threads when he could get them, and bought her flowers every week. He was feeling the bite of hard times, she knew that. Lover man, oh where can you be? 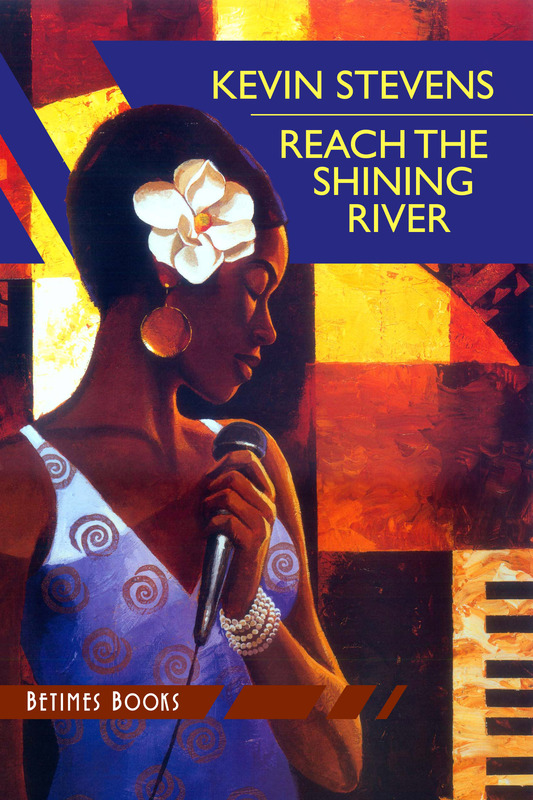 We hope you would agree that this is a striking new cover for Kevin Stevens’ novel REACH THE SHINING RIVER, with its soundtrack of jazz and blues. Read the full review — and more — here and an excerpt about Arlene Gray here (with a soundtrack!). We would like to thank the artist Keith Mallet who has graciously allowed us to use his artwork “Jazz Café” and, as always, our favourite designer JT Lindroos. “By the time the singer appeared, the house was full. Arlene Gray stepped elegantly on the stage and approached the microphone, one hand moving in time with the music, the other resting against the curve of her hip. There was warm applause. Light-skinned and full-figured, she wore a black, strapless sheath with sequins that sparkled in the house lights. She looked like a diva, but her voice was delicate, almost shy. She opened with “Willow Weep for Me”. Six years ago, when he was courting Fay, it had been the torch song for a generation. Irene Taylor had the hit, a big, show-stopping number with orchestral flourishes and quavering grace notes. But Arlene Gray’s version was low-key and off-center. She sang as if speaking to her audience, and the phrases moved gently and rhythmically, like the sound of lapping waves. So none will see me sighing and crying all alone. The sad music washed over him. Unused to whiskey, he grew maudlin. He thought of Fay. A lost cause. Solving the case wasn’t going to make any difference. It would land him the job with her old man and make him a shitload of dough, but none of that mattered. She might stay with him for what he could give her, but she hated something inside of him. Something that wasn’t going to change. He drank his whiskey. Let Mickey get the dirt on her. Let him find out the worst. At the end of the set he moved unsteadily to the bar. He ordered a double. The bartender was brisk but deferent. He wiped the counter with a cloth and set the drink on a beermat. “She’s something, huh?” Emmett said. 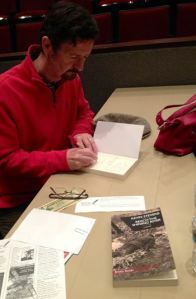 Last week I gave readings of Reach the Shining River at two different venues in St. Louis, Missouri: to staff and students at Fontbonne University, and to Saturday Writers, a writing group in St. Peters, Missouri, which is also a chapter of the Missouri Writers Guild. Both audiences were interested and well-informed, and both events reminded me how important it is for writers to leave the lonely confines of the desk on occasion and engage with others who love to read and write fiction. These days, big cities go out of their way to proclaim their cleanliness and safety. New York, LA, London, Paris…the city fathers of each note regularly how, compared with a few decades ago, their metropolises are much better to visit and live in. Crime rates have fallen. The cops are friendly. The streets are litter-free. What vice there is is socially acceptable or decidely unseedy. And who’d have it any other way? Well, readers of crime fiction, perhaps. Crime novels and cities go together like guns and ammo. And traditionally, dirty, unsafe streets with heavy fog and crumbling neighborhoods not only create atmosphere but plot opportunities as well. I live near Harvard Square in Cambridge, Mass, in a “Harlow buidling.” These beautiful brick structures were designed by Hamilton Harlow in the early decades of the twentieth century and were designed to blend in with the features of Harvard University buildings – red brick, elegant ironwork, and leaded glass windows. It’s a cool neighborhood. A really cool neighborhood for a writer, partly because so many famous authors lived nearby. Two doors up from my building is where William Dean Howells lived in the 1870s, when he was editor of the Atlantic Monthly. Watkins listened and nodded and said to Jesse’s dad, “You did right to send for me, Les.” He asked Wardell if he would like some lemonade. “On the road, I believe. Some time now. Watkins checked his gold watch and looked at Jesse’s dad. Watkins’s face was saggy and scared looking. “The boy’s had a fright,” he said.